All of Aladdin's classic characters are set to return in Disney's live-action version of the film arriving later this year. A new teaser that aired during Sunday night's presentation of The Grammys confirmed many of these returns, including Jasmine's loyal tiger pal Rajah, and Aladdin's trusty flying carpet. While the flying carpet may not exactly have a name, it definitely has a personality of its own, at least in the original animated film. 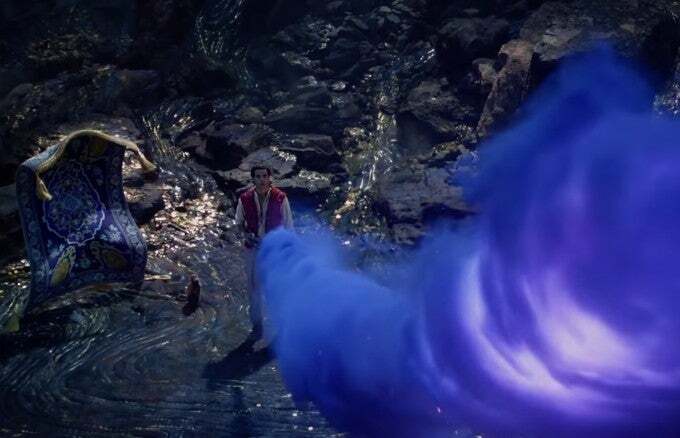 Always causing trouble and creating interesting situations for Aladdin, the magic carpet became a favorite amongst fans, so everyone was more than excited to see it pop up at the end of the live-action teaser Sunday night. If you missed it, take another look at the teaser, and wait for the final scenes in which Aladdin rubs the lamp and talks with Will Smith's Genie for the first time. Just like in the original movie, the carpet is standing up straight, reacting to what's going on in the world around it. It's most definitely a sentient being, making it seem as though there will be plenty for fans of the classic animation to love in this new take. The teaser also gave us a glimpse at the royal Princess Jasmine, played this time around by Power Rangers star Naomi Scott. During an interview late last year, Scott said that she always looked up to the character of Jasmine growing up, and it was a long-time dream to play her on the big screen. “Princess Jasmine is genuinely one of my favorite princesses growing up, although I feel like anyone would say that," Scott said. "But genuinely, she was it for me. It was her and Pocahontas; she was definitely top two, for sure. She’s someone who is so beloved, and having an animated character and bringing it to life in the way that it’ll be authentic and natural is the best part of the job for me." All that to say, while Scott has a deep love for the character that came before, her version of Jasmine will be much different than the one we remember. Are you excited for the live-action Aladdin movie to make its debut? Let us know in the comments! Disney's Aladdin, directed by Guy Ritchie, hits theaters on May 24th.